Please join Andrews Osborne Academy (AOA) as they host a historical lecture about The Andrews School on Friday, September 27th, 2013, from 4:30 p.m. – 7:00 p.m. The lecture will take place in the auditorium on the campus of AOA, located at 38588 Mentor Avenue in Willoughby, Ohio. The lecture will be presented by Mr. Don Lewis of the Willoughby Historical Society and Mr. Dan Fishwick . This event is free and everyone is welcome to attend, no RSVP required. The lecture will cover the over 100 year history of the school and its beginnings in Willoughby. The evening will be highlighted by the dedication of an AOA classroom for one of the most beloved individuals in the institution’s history and former faculty member of 48 years, Barbara Caseau. Tours of the school grounds including dorms, tunnels, equestrian center, and all school buildings will be open. Andrews Osborne Academy (AOA) is an independent, coeducational, college preparatory day (grades Pre-Kindergarten through 12th) and boarding (grades 7-12) school near Cleveland, on a beautiful 300 acre campus located in Willoughby, Ohio. Our Academy offers elementary, middle and secondary education to committed students in a multicultural setting. Enrollment opportunities for the 2013-14 school year are available. 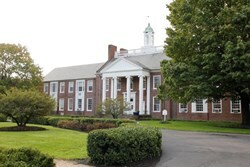 Contact the Office of Admission to arrange a tour at 440-942-3600 or visit our website at http://www.andrewsosborne.org. For more information regarding the event, please visit the AOA website: http://www.andrewsosborne.org.